Enormous, powerful enemies found in the Hunter's Nightmare. 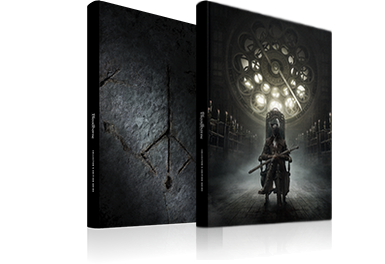 While they have some similarities with the Executioners encountered in and around Yharnam, they have a large arsenal of new tricks up their tattered sleeves and should be handled quite differently. Nightmare Executioners armed with axes have incredibly long reach and their attacks tend to carry them forward considerable distances, making it dangerous to take them on from the front; they are also good at punishing attempts to quickstep past them with wide horizontal swings. While only one of these enemies in a single location carries the Church Cannon, he is positioned at a bottleneck at the end of a large, open area with no obstructions for you to use as cover from his explosive cannonballs; he'll fire both long- and short-range shots and will also his cannon as a melee weapon. Both of these subtypes have tremendous amounts of health and wearing them down can be difficult, but both are susceptible to normal interrupts and staggers. Axe-wielding Nightmare Executioners alternate between horizontal and vertical melee swings of varying speeds and can perform combos of up to five consecutive hits, many of which have wide arcs and reach directly behind them; they will also perform an extremely swift forward shove attack with their axes at pointblank range and can repeat this move almost immediately, making it extremely dangerous to stand near to them for any length of time. At close to mid range they'll use a jumping vertical chop which comes out very quickly and covers a great deal of ground; often they will deliberately time this attack to punish the use of consumable items such as Blood Vials. At mid range they favor a running attack consisting of several steps forward followed by a counterclockwise horizontal chop; this move has a wide arc and very long reach, and the extended delay before the swing can give misleading indications of when to dodge it. They will use both of these attacks to close the distance between themselves and their targets, making it difficult to escape their surprisingly rapid advance. They will sometimes perform a short-range grab attack, rearing their heads back shortly before jabbing the ground in front of them with their tentacles. The startup animation for this attack is easily identified and leaves enough time to back out of range before it activates, providing a prime opportunity for an interrupt. Their most dangerous technique, however, is the Cosmic Explosion - a massive spherical area attack centered on their axe, which inflicts arcane damage and adds smaller bursts of arcane energy to all of their subsequent attacks. Nightmare Executioners are aggressive towards other enemies of the Nightmare, and will engage them in combat if their paths happen to cross. The safest way to fight these enemies is from a distance. Stay outside the range of their melee combos and bait their jumping cleave or running slash, then either interrupt these attacks or quickstep past them and swing one or two times during their recovery. They recover fairly quickly and will counterattack straight away, so be prepared to back off immediately after striking; additionally, pay close attention to their attacks and try to quickstep through each swing in the opposite direction if you're unable to move out of range in time. When their health drops below 67% they will use Cosmic Explosion; this attack has a lingering hitbox, so dodging through it with invincibility frames is not possible. They will take halved damage while charging the buff and it cannot be interrupted, but they can be knocked out of it with a Cannon shot, two hits from the Fists of Gratia, a single use of the Beast Roar or any other attack that breaks their super armor. If knocked out of the buff, they will not attempt to use it again. Immediately after the initial explosion, there is enough time to quickstep behind them and stagger them with a charged (R2) swing. Their recovery period after the ensuing visceral attack leaves enough time for them to be staggered again; in this manner it is possible to trap then in a chain of visceral attacks and prevent them from taking further actions. 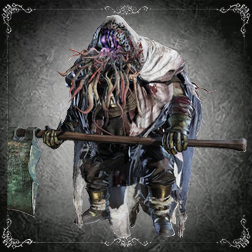 Nightmare Executioners are susceptible to slow poison, though poisoning them is an inefficient strategy for players with more advanced equipment and is generally only useful to those tackling the Hunter's Nightmare very early in the game. They can also be lured into the vicinity of the Old Hunters and Old Hunters' Hounds prowling the surrounding areas, which will result in the two sides attacking one another and can be useful for weakening these powerful opponents before engaging them directly. During Nightmare Executioner (Axe) grab attack animation, damage can NOT be reduced by repeatedly pressing buttons (mashing). Despite Nightmare Executioner (Axe) having 999 Rapid Poison resistance it is still vulnerable to such status. Jump Attack Yes Quickstep sideways or forward past it. Axe Shove Yes Quickstep backward or avoid standing in front of them at pointblank range. Running Slash Yes Interrupt it or quickstep clockwise through it late in the animation. Tentacle Grab Yes Strafe backward out of range during the windup and interrupt it just as they strike. Cosmic Explosion No Used only once when their HP drops below 67%. Break their super armor to knock them out of it or immediately quickstep away several times when they begin using it.